Twitter’s 140-character limit has always been an annoying limitation, but, the social media giant realizes how irritating it is to fit your thoughts in 140-character, especially when typing a reply. 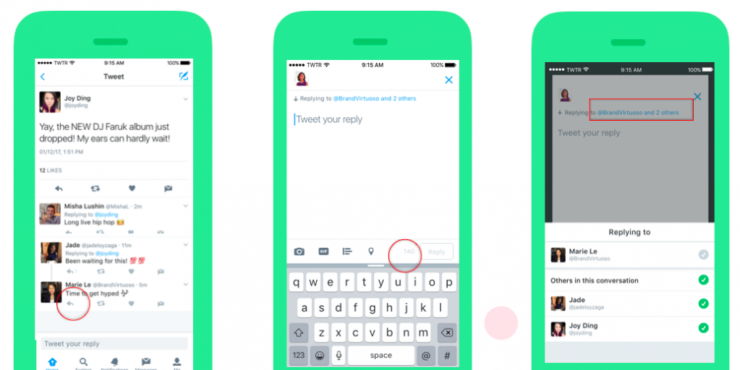 The company has finally made some changes to the 140-character limit for replies. It will no longer count a username towards your 140 characters. The change is currently being rolled out to its desktop version and app (Android and iOS). Well, we were expecting more relaxation regarding the word limit, but it did give us a little space. Now, when you reply to someone, his/her username will not be counted in the 140-character limit. Instead, the username will appear above your reply, which will also make your tweet easier to read and clean regarding visibility. It also means that now you won’t see the unwanted @ cluster in reply strings. In addition, the company is also rolling out a new “Replying to” feature, which allows you to check or uncheck usernames of the people or individual you want to keep in your conversation. That’s the thing about Twitter; it rolls out small changes when its users are awaiting bigger ones. It’s been forever since Twitterati has asked for an “edit.” button but we don’t think that the wish would be granted soon. Twitter’s rival Facebook has recently rolled out a slew of significant design changes packed with new features, but all that does not seem to bother Twitter at all. Having said that, Twitter has become an intrinsic part of our lives, especially with its popularity among celebs, politicians, brands, and others. Even the president of the United States uses it as his primary tool to communicate his thoughts. On a brighter side, it is working on new tools to curb online abuse.